Sump pumps protect your home from the build up of rain water and melting snow around your foundation. Allowing water to accumulate around the lowest levels of your house will create persistent damp conditions which can trigger the growth of mold, mildew and big problems over time. Installing these types of water removal systems is best left to an expert plumber. We’ll help you select the best model and size for your property and assure that it is connected properly. Sump pumps should have a preventative maintenance from time to time to be sure they are running optimally. The sump pump doesn’t run every day, but if it would fail to run when you need it, the results can be disastrous. That’s why we offer a emergency service. If you notice that during a heavy downpour your sump pump fails to kick on, especially if you’re noticing ponding on your property around the house, give us a call. Day, night, weekends or holidays. Service areas include Main Line, Delaware County, Chester County, and Montgomery County. If you don’t see the type of work you are interested in listed here, please contact us. Chances are what you want is well within our skill set! Local experienced heating, sewer and drain contractors. Licensed and Insurance. Serving Delaware County and the Main Line since 1989, including Broomall, Havertown, Springfield, Upper Providence, Newtown Square, Upper Darby and Glen Mills. Regular office hours are from 8 am to 4:30 pm Monday through Friday. 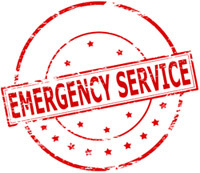 However, we are available for Emergency service by simply calling our main number.